Martini glasses emblazoned with the words "Mommy Juice." Hundreds of people lined up in the bitter cold for a Christmas-themed bar. Cocktails, including one at $8,500 a pop, made with vintage liqueurs. It may seem like we're living in the golden age of cocktails — yet 30 percent of Americans don't indulge at all, while another 30 percent have only two alcoholic drinks per week. Millennials — who drive so many trends these days — are actually drinking less. And while some companies might view that as a problem, many beverage entrepreneurs see it as an opportunity. "There's a greater movement of people not drinking, for a variety of reasons," says Pam Wiznitzer, beverage director of New York City's The Henry at Life Hotel, which invents specialty cocktails using ingredients from the kitchen and house-made syrups. "Even people who drink want to have a break sometimes, but the non-alcoholic options weren't particularly creative." 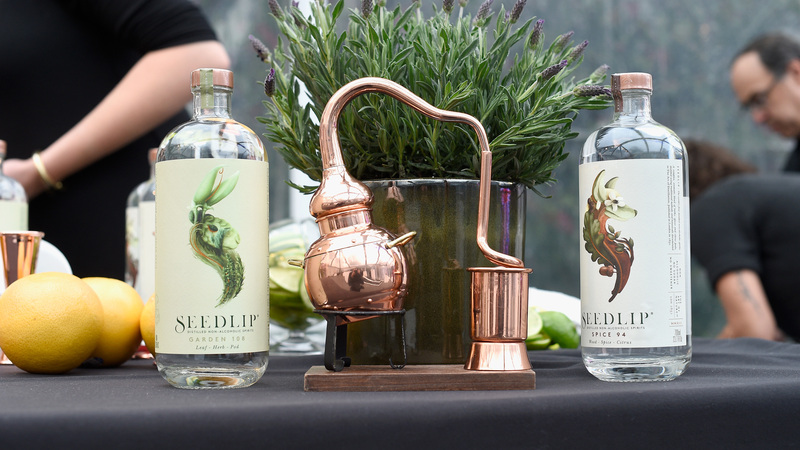 So when Wiznitzer, a past president of the U.S. Bartender's Guild, heard about Seedlip Distilled Non-Alcoholic Spirits, she was, naturally, a little skeptical. "The idea that you could craft a product that could act in the capacity of alcohol without having alcoholic content seemed contradictory," says Wiznitzer. She was won over, however, when she met Ben Branson, who was inspired to create Seedlip when he came across a 17th-century book, The Art of Distillation. Written by physician John French, the volume contained recipes for distilled non-alcoholic remedies for a variety of maladies — from epilepsy to kidney stones. Branson had other ideas. "I wanted to change the way the world drinks, with grown-up alternatives," he says. "Nobody feels great drinking a Shirley Temple or a club soda when they go out. I wanted to create something without compromise, without trying to copy something else." For Branson, that meant creating "spirits" that didn't necessarily mimic gin, tequila or another traditional alcohol, but instead using herbs, spices, citrus and even peas from his family farm to create distinct flavor profiles. Bartenders like Wiznitzer add Seedlip to a variety of mixers to create unique zero-proof cocktails. In fact, says Wiznitzer, "Quite often, no one knows the difference." Zero-proof brands such as Seedlip, Ceder's, Herbie, Whissen, and Strykk are aiming to disrupt the way we view traditional liquor-focused cocktails. Indeed, Joanna Carpenter, a self-described "semi-sober" bar director at Town Stages in Manhattan, says that flavor, not alcohol content, is the true driver behind a great cocktail. "When you get down to it," she says, "we're selling a toxin. If there's a way to celebrate a flavor and a beautiful experience without always relying on alcohol, then we should be doing it." Curious Elixirs, a line of bottled zero-proof cocktails, was dreamt up by former bar owner John Wiseman after a night when he says he consumed some 20 alcoholic drinks — and suffered no ill effects the next day. "I was trying to chase the dragon," he says, "and that's when I realized it was a problem." Coming up with non-alcoholic options to some of his favorite cocktails, such as a classic Negroni or a spicy cross between a Dark 'n Stormy and a margarita, Wiseman set out to craft alternatives that were less sweet, low-calorie and easy drinking. "I still like a cocktail," Wiseman says, "but if I'm hanging out with friends for four or five hours and have a couple of traditional cocktails, what am I drinking in between? Customers who don't want alcohol should be able to have something special, too." The reasons why people choose not to drink alcohol are varied, says Ezra Star, general manager of Boston cocktail bar Drink, such as health, religion or allergies. But several studies, including one funded by Mocktails, a U.K.-based bottled zero-proof cocktail company that Star works with, also found that one compelling reason for the younger generation to abstain was social media. "Young people don't want to look ridiculous," Star says. "They want to participate, but they are also very conscious of how they look." Not wanting to be blackout drunk is always a good goal, but choosing not to drink when out with friends can sometimes be viewed as social suicide. "I personally have gotten bullied for being out with large groups and not drinking," says bartender Carpenter. "It's important for people to be able to go out to a bar and not feel shamed or judged. You just want someone to be nice to you and give you a sense of belonging." That's where a well-crafted zero-proof cocktail comes in — and it might cost close to the same as the alcohol-fueled items on the same menu, because of the labor and the pricier ingredients being used, whether it's exotic fruits or products like Seedlip, which retails for about the same price as many traditional liquor brands. "I love to cook," says Carpenter, "so I'm making shrubs and bitters and garnishes. There's a lot of labor that goes into those. I use Seedlip for a non-alcoholic Gibson martini with a house-made pickle brine — it's truly a craft cocktail. It just doesn't happen to have alcohol in it." In developing recipes for the Mocktails brand, Star focused on building complex flavors that could provide the same experience of traditional favorites, including a sangria made with a blend of grapes sourced from Italy, France and Spain. Bitter orange and juniper lend some traditional flavor to many of the recipes, while ingredients like carthamus flower and black carrot can add more earthy, vegetal notes, keeping the recipe from skewing too sweet. "People are shocked that the zero-proof margarita doesn't have tequila in it," says Star. "But complex flavors can mimic spirits." Seedlip's Branson agrees, saying, "If you take the alcohol out, it won't just magically be the same. Ultimately, that drink has to stand on its own."